A new paper published in Nature Geoscience finds that the heat content of the North Atlantic Ocean decreased by 0.1×1021 Joules over the 54 year period from 1953 - 2007. The paper is among the first to examine heat content changes along the entire vertical column of the ocean from bottom to surface. The paper adds to several others showing that Trenberth's "missing heat" has not gone to the depths of the ocean, but rather never existed in the first place. Table S1 (c) from the supplementary information. 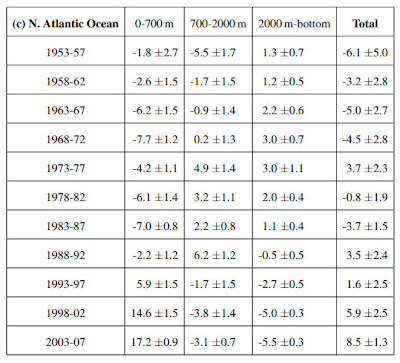 The total change in heat content for the N. Atlantic Ocean [20-66 degrees North] from the bottom to surface from 1953-2007 is - 0.1×1021 Joules [sum of the right column]. Note this net change is much less than the range of uncertainty, but shows no evidence of "missing heat" sinking to the deep ocean. 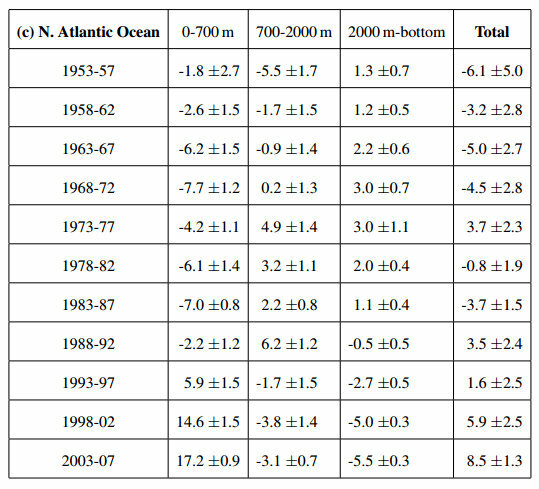 The data instead shows the deep N Atlantic Ocean has cooled since 1988, far beyond the range of uncertainty. The efficiency with which the oceans take up heat has a significant influence on the rate of global warming. Warming of the ocean above 700 m over the past few decades has been well documented. However, most of the ocean lies below 700 m. Here we analyse observations of heat uptake into the deep North Atlantic. We find that the extratropical North Atlantic as a whole warmed by 1.45±0.5×1022 J between 1955 and 2005, but Lower North Atlantic Deep Water cooled, most likely as an adjustment from an early twentieth-century warm period. In contrast, the heat content of Upper North Atlantic Deep Water exhibited strong decadal variability. We demonstrate and quantify the importance of density-compensated temperature anomalies for long-term heat uptake into the deep North Atlantic. These anomalies form in the subpolar gyre and propagate equatorwards. High salinity in the subpolar gyre is a key requirement for this mechanism. In the past 50 years, suitable conditions have occurred only twice: first during the 1960s and again during the past decade. We conclude that heat uptake through density-compensated temperature anomalies will contribute to deep ocean heat uptake in the near term. In the longer term, the importance of this mechanism will be determined by competition between the multiple processes that influence subpolar gyre salinity in a changing climate.